This past weekend I attended the wargaming day in Brisbane called the Brisbane Muster. One of the many demo and participation games was a 15mm Force on Force game put on by Kevin and Mark. I joined this game as the insurgent player against a French force. The scenario was that a small French recon team of 3 vehicles had been ambushed by a group of students armed with small arms and 1 rpg. One of the vehicles had sustained some damage and 2 of its crew were seriously hurt and in need of immediate evacuation. A QRF of another light vehicle and 2 x APCs with remote weapon systems were enroute to assist with the extraction of all from the site. Meanwhile, the insurgents were attracking attention and numbers were growing. The volume of fire the French were drawing made it impossible for the 2 surviving vehicles to man their fixed weapons and these remained buttoned up for most of the duration of the contact. 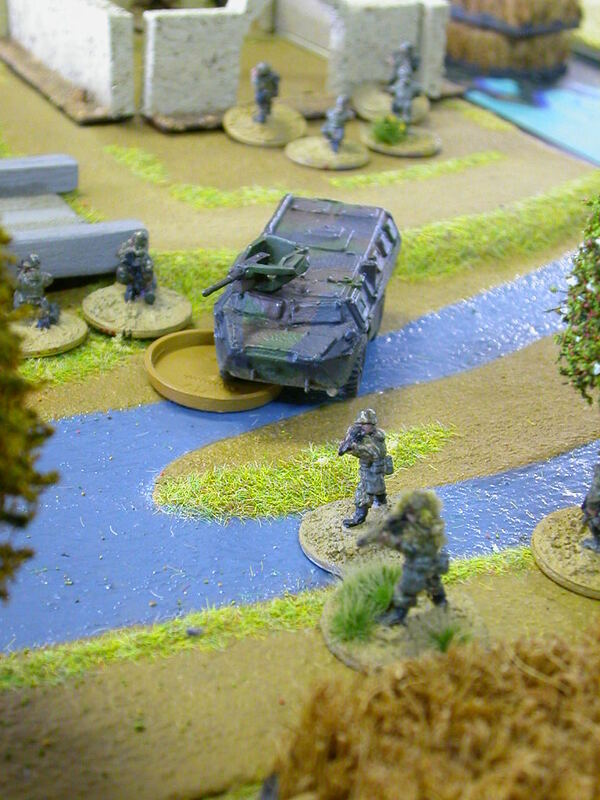 Soon after the ambush was sprung, the French QRF arrives on the right of the battlespace made up of another light recon vehicle with a 50 cal MG and the 2 x armoured APCs full of heavily armed French troops. The lead vehicle hits some rough terrain and destroys its front end beyond repair, blocking the road for the remaining vehicles. The 1st APC veers left and into the creekbed and gets bogged while the 2nd APC moves north and around the carnage. All newly arrived vehicles draw fire and soon all recon vehicles including the light vehicle from the QRF are either destroyed or heavily damaged. With the heavier armour of the APCs, the French begin to take the offensive to widen their area of control in order to get an evac chopper in for an increasing amount of seriously wounded soldiers. More insurgents arrive and pretty soon the French are surrounded on all sides and fighting for their lives. The bogged APC gets itself out of the creekbed and up onto the southern bank and with infantry support, gains ground on the insurgents, clearing out a number of buildings and pushing enemy fighters back into a village. The 2nd APC moving north spent a lot of time overwatching for any threats from the north but eventually needs to move. It pushes forward but is taken from the side by an awaiting enemy with an RPG. The vehicle is destroyed with all men onboard forced to fight their way into the cover of a high crop. Enemy numbers are increasing and large groups can be seen approaching from the left. The French commander calls in a nearby Apache gunship which destroys a recoilless rifle coming into action and a number of insurgents. The effect of this is astonishing as the entire left side of the battlespace goes quiet from suppression by the gunship. As more insurgents race through the village to get into the fight, the French begin withdrawing on foot along the road the QRF arrived on, leaving burning vehicles, and several severely wounded and 1 dead soldier. As a gesture of goodwill, the insurgents take the dead and wounded to a Redcross site the next morning and disappear back into the mountains. Wow. That is a beautiful game setup. Very nice figs and terrain. more please! Very nice AAR. If you are in contact with Kevin, tell him that the BIG FOF campaign blog is a great thing but unlike yours, we cant' post comment... sad and frustrating.